Some destinations offer miles and miles of natural beauty and historical sites galore. Some ancient cities house buildings carrying rich, centuries-old tales. Others possess museums highlighting artifacts and generations of culture and traditions. 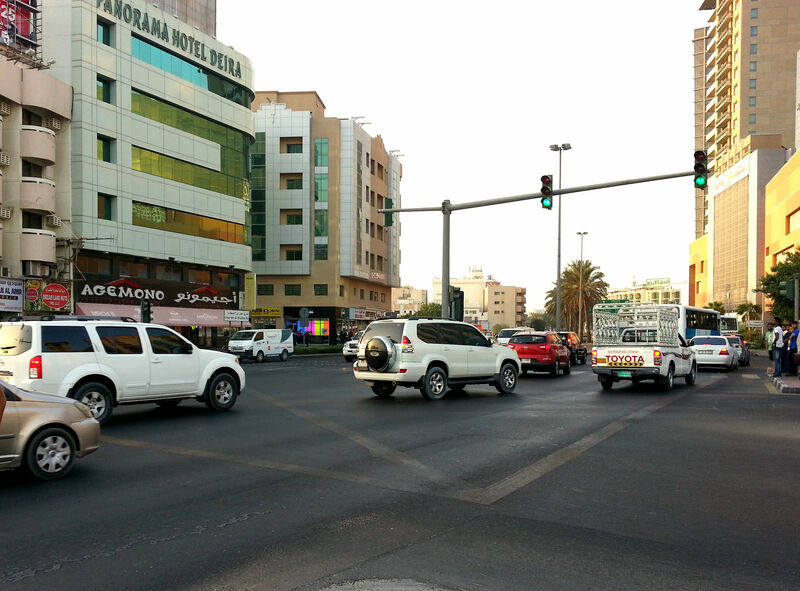 Some destinations offer such wonders, but I wouldn’t include Dubai at the top of that list. 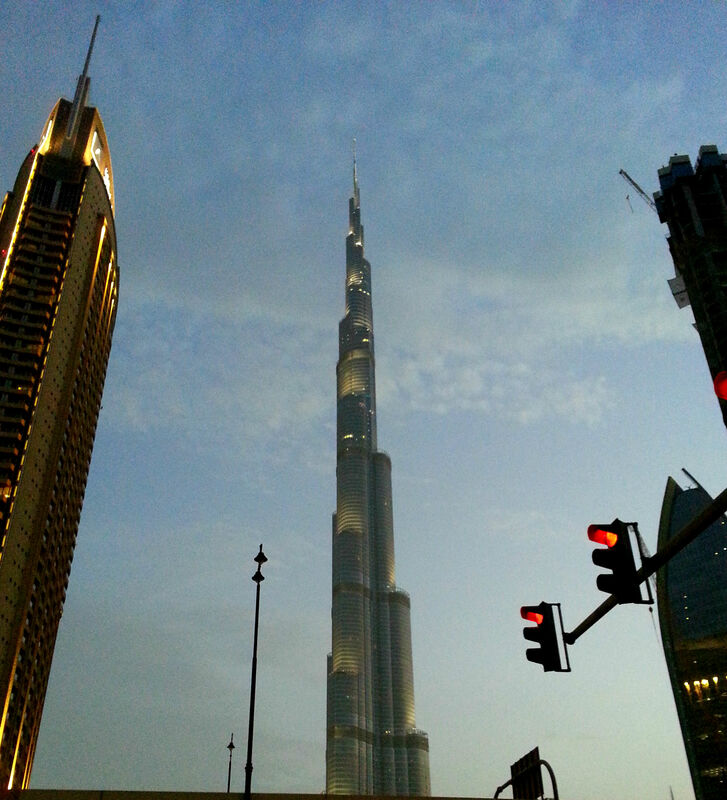 Dubai is indeed beautiful, but its allure lies more in the new than the old. It’s beautiful thanks to the glistening skyscrapers towering over the tiny people below. The brilliant city lights illuminating the desert sky. The magnitude of the new edifices, all competing to be “world’s biggest” or “world’s best.” Although there are older, more traditional parts of the city, those are not what the rest of the world envisions upon hearing the word “Dubai.” I mean, I walked through the average, less glamorous areas because I wanted to see real life, but that’s not why most people visit Dubai. Randomly on the street, and pretty much everywhere in between. Can you imagine if at every turn you saw giant banners of President Obama and your state’s governor? Different, right? I found this particular juxtaposition of best selling biographies rather comical. 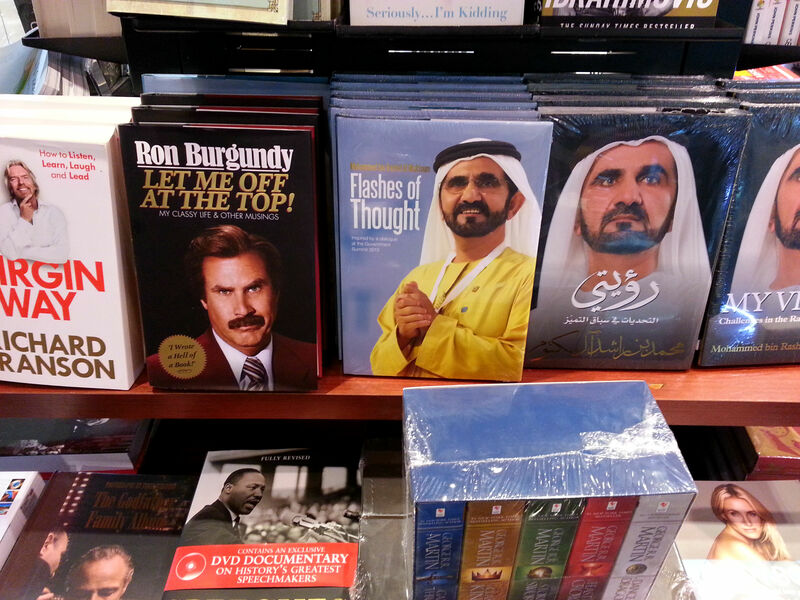 The ever present ruler of Dubai, Sheikh Mohammed bin Rashid Al Maktoum, next to the fictitious Ron Burgundy. I mean, really? Dubai revels in its man-made wonders and excesses, seemingly harboring a desire to mimic (and surpass) the over-the-top image of Las Vegas. But Vegas it is not. 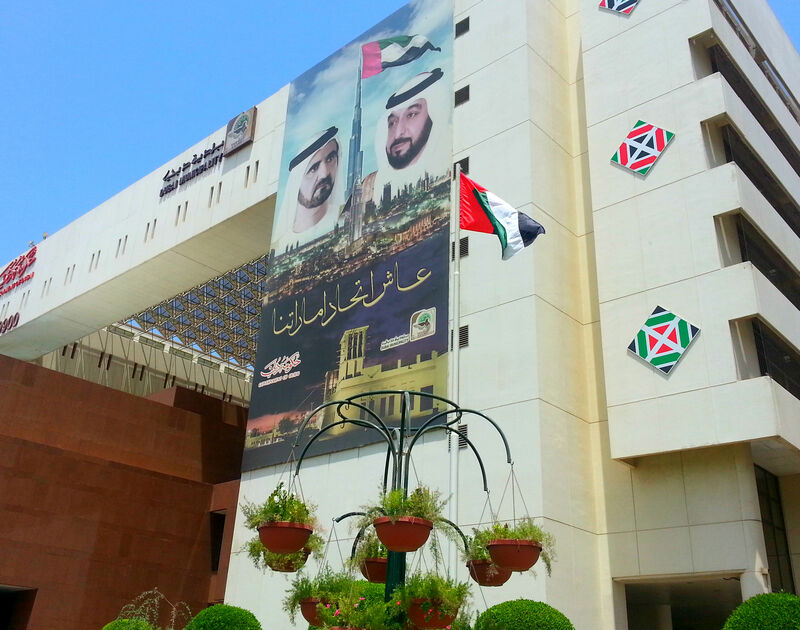 Instead of lauding excessive drunken encounters à la “what happens in Vegas stays in Vegas,” Dubai sweeps that under the rug and focuses more on excessive spending. Lots and lots of spending. Indeed, most of the times I asked people what they liked about Dubai, the answer was shopping. 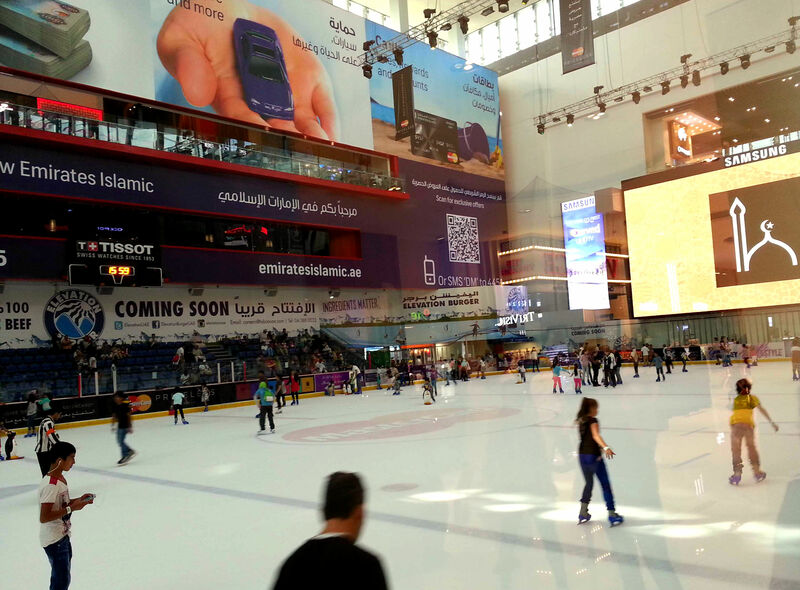 Because I only had 36 hours in the city and had been assured there weren’t incredibly notable historic sites I would miss, I focused my attention on checking out what the fuss was about at Dubai Mall. It’s the largest shopping mall in the world based on total area. Immediately upon arrival, the mall smacks of glamour and wealth, as evidenced by the Porsches and Lamborghinis lined up in front of the Cartier store. 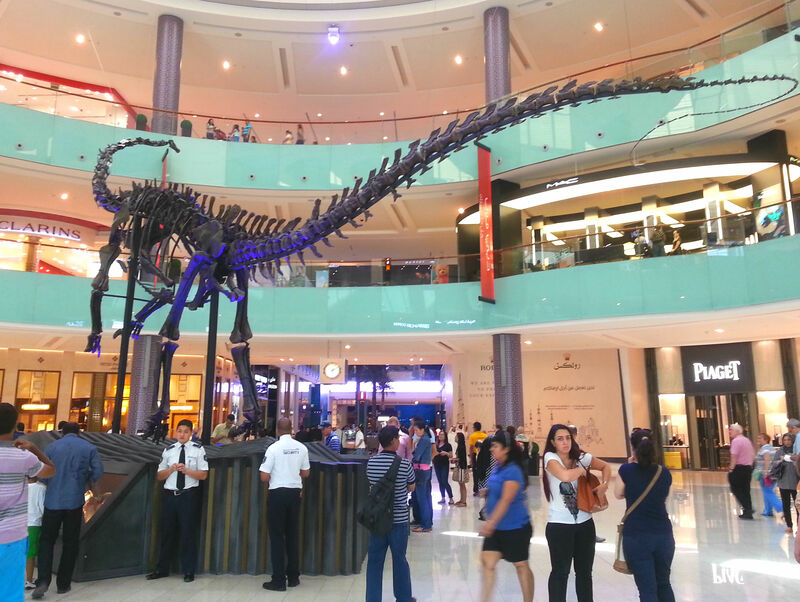 Then, walking inside, visitors are greeted by a dinosaur skeleton. A dinosaur. In a mall. Of course. 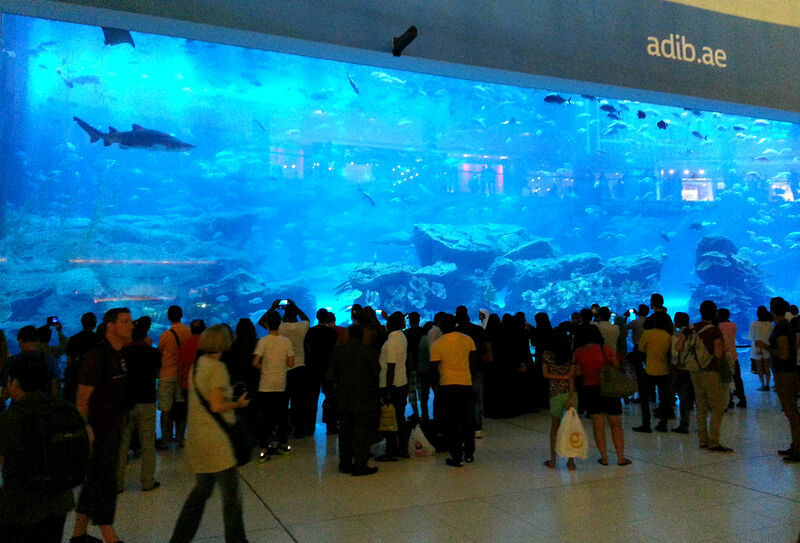 And a breathtaking aquarium, with the world’s largest acrylic panel. 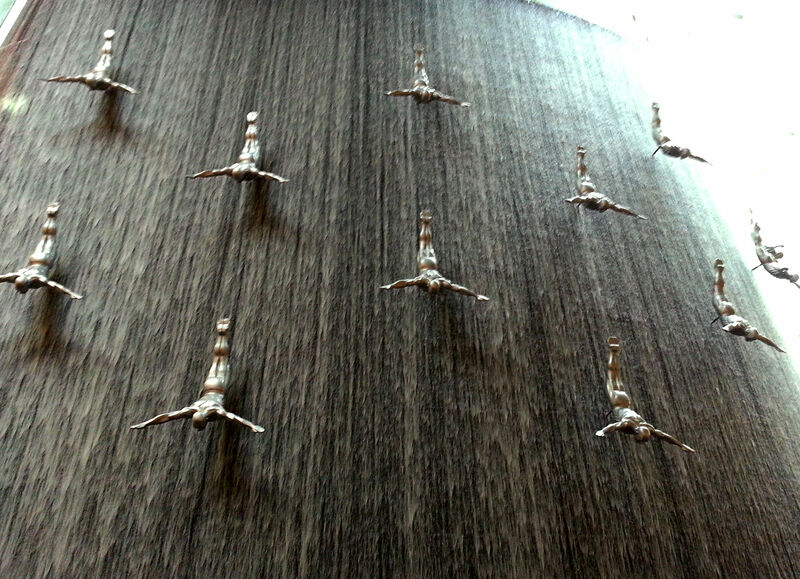 It’s really no wonder that in 2012, according to Wikipedia, the Dubai Mall brought in more visitors than all of New York City. 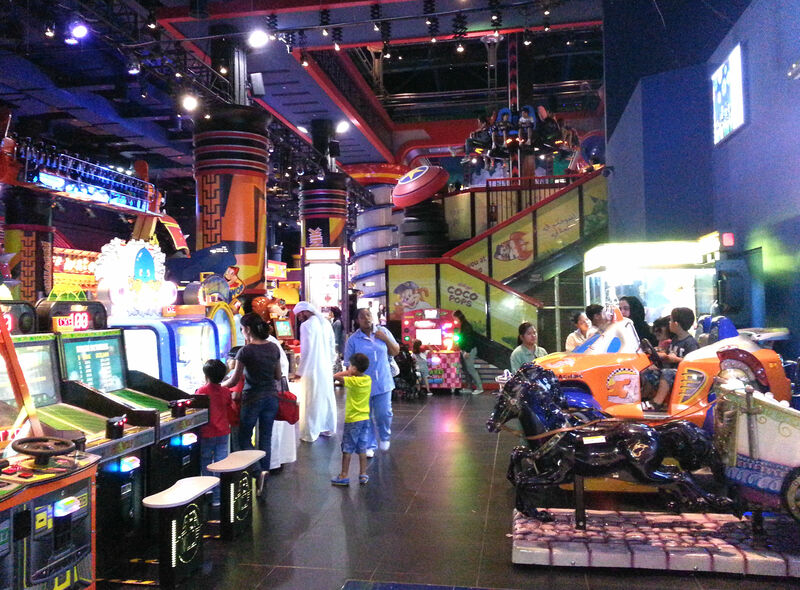 Having worked at Mall of America in my younger years, I didn’t think I would be impressed by the Dubai Mall, but I was wrong. It had a different feel altogether, oozing an extravagant sophistication lacking at Mall of America. Women sport crystal encrusted hijabs and men wear shiny, narrow Italian shoes. Shoppers earn bragging rights by purchasing the most expensive items in a store rather than the most heavily discounted. 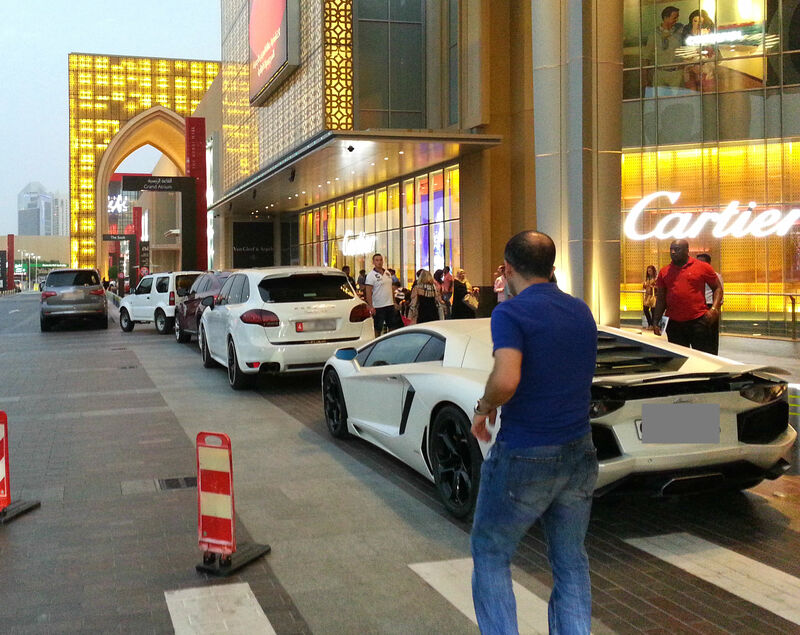 New Dubai really seemed to be a playground for the rich. Clearly, my TJ Maxx outfit did not garner longing glances from the high falutin visitors. Walking outside the mall proves just as much of a sensory overload. Immediately in view is the Burj Khalifa, the world’s tallest man-made structure, with the rest of the built-up downtown looming nearby. While some people scramble at the opportunity to pay around $80 to have high tea on the monstrous building’s 123rd (out of 163) floor, that isn’t my thing. I was happy enough with my free view from the ground. I mentioned in a previous post that I loved the architecture in the UAE. 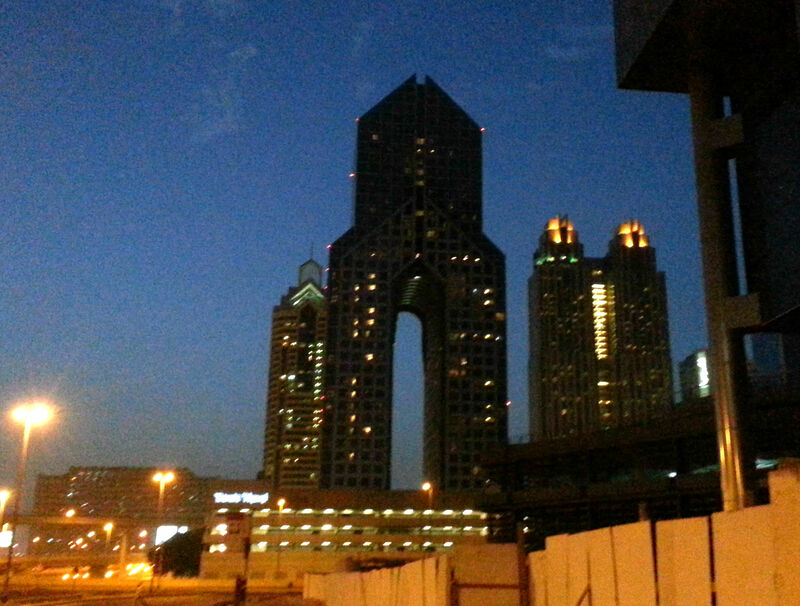 But Dubai’s buildings are like great architecture on crack. 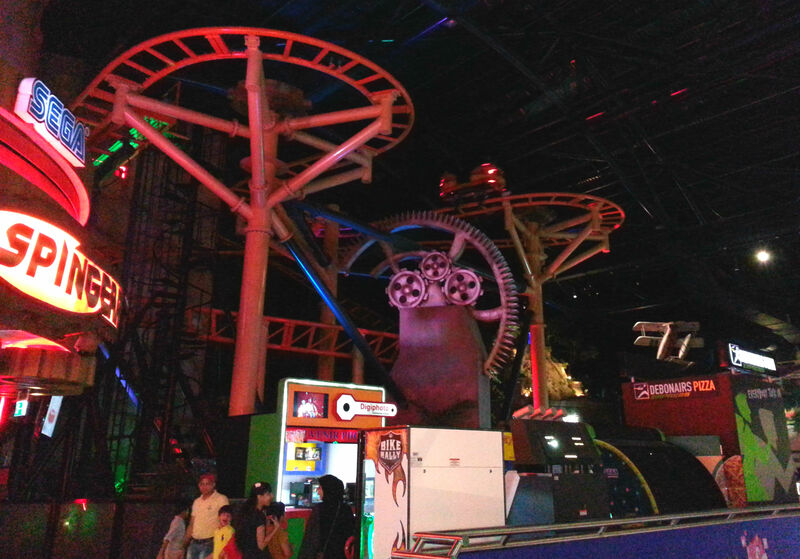 My eyes kept devouring the buffet of curves, spirals, lights and geometric shapes. It became impossible to photograph every appealing building I passed… both because of the sheer quantity and the inability to back up far enough to get many of them within frame. I looked up so much that I kept tripping because I missed obstacles at foot and eye level. Until, of course, another dust storm blew in and it was all I could do to avoid tripping on the quickly accumulating sand piles in the streets, while simultaneously shielding my eyes and nose from the whipping dust. Again, I was reminded of the benefits of wearing full face covering. I removed my hands from my raw, chapped face just long enough to snap this photo with the skyline in the background. 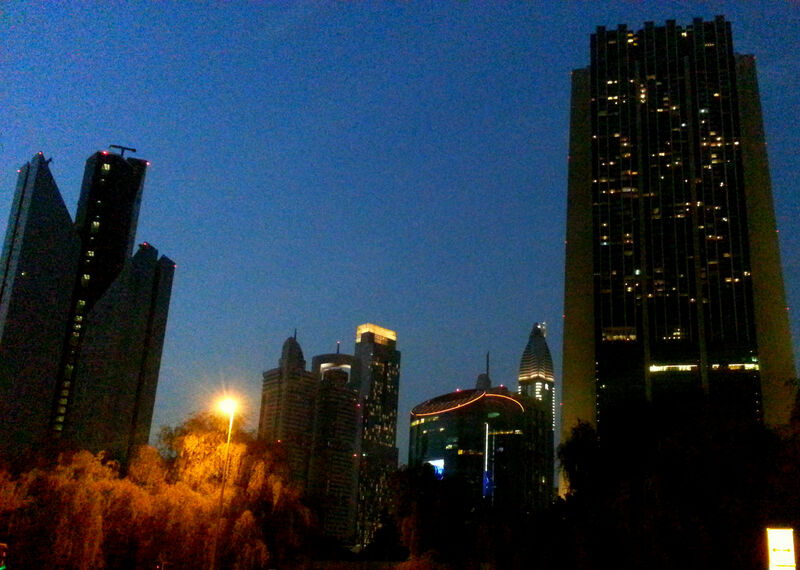 You would see more gleaming buildings if it weren’t for the dusty haze. 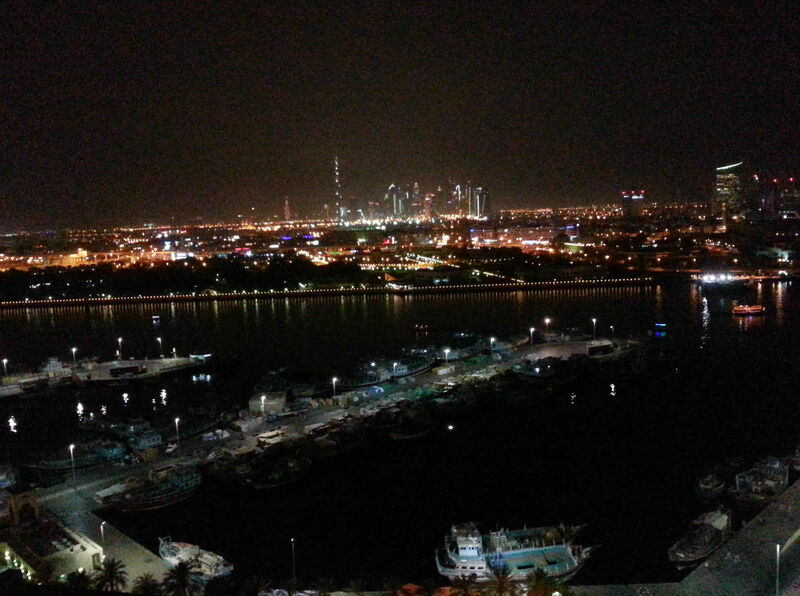 Another hazy photo of the skyline, this one snapped from my hotel’s rooftop pool. 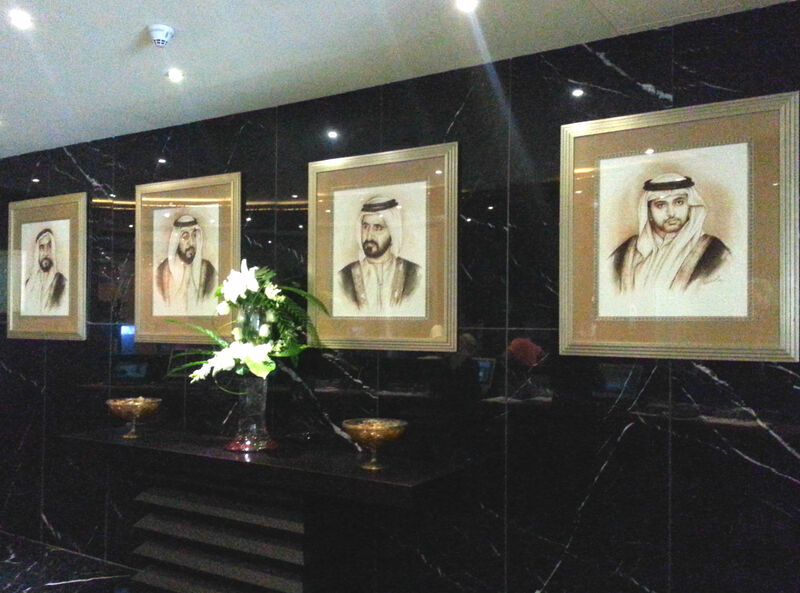 Even the Dubai airport outshines other airports. A lady greeted customers at the door, asking if they had any questions or needed directions. Except she wasn’t real; this woman is a hologram. I can’t even get my airport to put in more than one ticket-printing kiosk, and Dubai has a hologram directing customers and solving their every problem. Swanky. 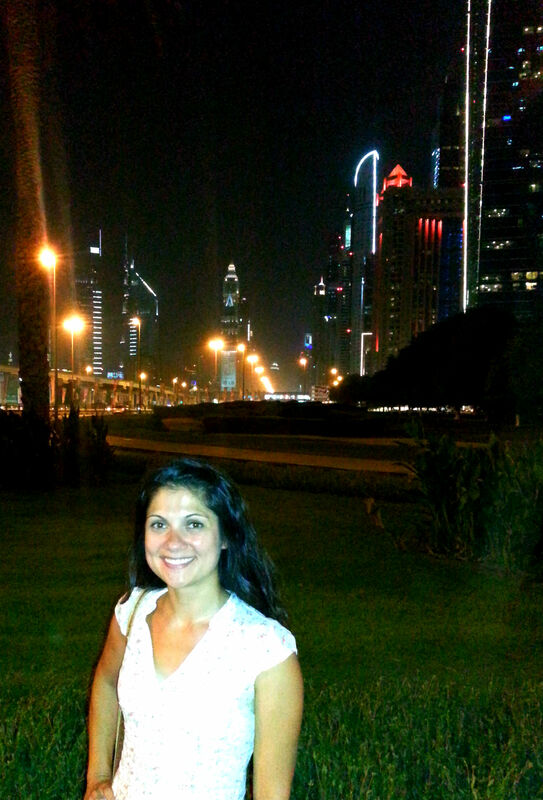 Although the glitz and glamour of Dubai was fun to experience, I think once is enough for me. At the very least, I won’t need to go back for a long time. The lifestyle certainly was a spectacle to behold, but not one that I would enjoy for an extended period of time. I did, however, really enjoy the ability to be more openly silly and freer with my actions than in other parts of the UAE. 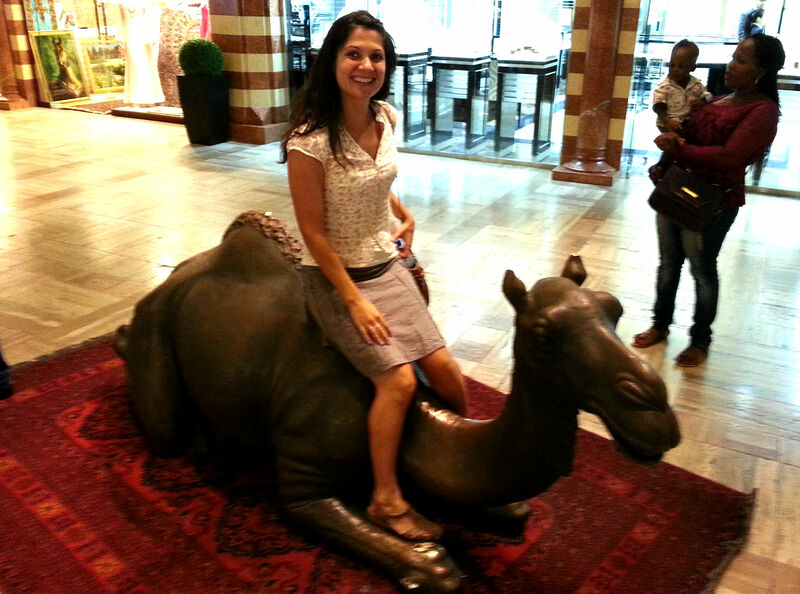 Because as we know, I must ride the statues.